Three and a half years ago, I wrote this article about how Crillon Importers and their absinthe brands (most notably Absente) were misleading consumers. Thujone's effects have been outrageously exaggerated for many many years, even after being thoroughly debunked through scientific analysis. The U.S. legal limit for thujone is 10mg/l and the EU limit is 35mg/l. Even assuming that their European offerings have 3.5 times the thujone limit of their US offerings, what they fail to mention is that both limits are considered THUJONE FREE. So when they say they have the maximum amount allowable by law they are telling the truth. But they are also saying that they contain NO THUJONE. I also feel the need to object to their claims of containing the maximum amount. Unless they are intentionally adding in more thujone to each batch to 'top it up' to the 10mg/l or 35mg/l limit, there is practically no way to keep it right at the limit through natural means. Thujone levels in wormwood vary based on the time of year the wormwood is harvested and its terroir. Further, each year the levels of thujone vary. It would be impossible to maintain such a standard as to come it directly at the limit with each batch. The only way this could happen is if they test each batch before sending it to the TTB, then adding thujone to it. I very highly doubt that they would go to this length, as it would be cost prohibitive. This post makes me laugh, as it pretty much invalidates what Crillon had been claiming for years. By claiming that Artemisia Absinthium is the authenticating factor for absinthe, they are indirectly claiming that their previous version of Absente, which was on sale from the late 1990's up through 2008, was NOT absinthe, since it did not contain said botanical. In essence, they have been misleading consumers for over a decade. Further, the claims that it's the thujone that make their product so 'sublime' (their words), is falling back on the same misleading marketing that they've been using for years. Let's also not forget that these brands contain sugar and artificial colorings, which would invalidate them from being authentic absinthe to begin with. But this type of marketing is even more inexcusable. Specific health claims and health related statements. How long are they going to continue this charade about thujone? Only time will tell. But this underscores the need for consumers to do their own research into what they are buying. Well said, Brian. It's a pity they don't use more of their marketing budget for R&D. They clearly have the capability of making decent, authentic absinthe. I can't imagine why they don't. I see that The Green Movement has edited the post which originally referred to the "resulting #thujone content." It now just states: "The element of artemisia absinthium authenticates #absinthe brands distilled with the botanical known as #wormwood. Discover a sublime sipping experience at Absente.com." Oh and they haven't bothered to reply to my question which is: "You write: "We will only "censor" posts that are comprised of curse words and no valid content," and "Everyone is entitled to their own opinion, thank you again for taking the time to again share your feedback." But as I understand it you have banned Brian Robinson Review Editor of the The Wormwood Society - Absinthe Education Organization from posting here. So your comments do not appear to be true. Can you explain your position on censorship and free speech, please." Or to a subsequent question: "So is this real absinthe or not? I'm addressing the company Absinthe - The Green Movement. Please explain." "The U.S. legal limit for thujone is 10mg/l and the EU limit is 35mg/l. Even assuming that their European offerings have 3.5 times the thujone limit of their US offerings, what they fail to mention is that both limits are considered THUJONE FREE. So when they say they have the maximum amount allowable by law they are telling the truth. But they are also saying that they contain NO THUJONE." Can someone explain this to me? 10mgmg/L may be termed thujone free but there is still 10mg/L. but the terminology is indicative of there being very low quantities of thujone, and most likely not enough for any psychoactivity, correct? and how are distillers staying within these bounds? The natural distilling process produces less than 10mg thujone per liter? because as you've mentioned thujone is heavy and gets mostly left behind? Brands aren't extracting and removing thujone from a finished distillation, right? I get psychoactive effects beyond alcohol with absinthe. Depending on the brand and amount consumed, sometimes this produces lucid dreams after falling asleep. Where the detail is very life-like and I know that I am alseep. A reoccurring theme in these dreams are double of things. Like 2 of my cat and 2 of my dog. These dreams are dark and surreal at times. I will also get false awakenings and sleep paralysis that can lead to OBEs in someone that knows a technique. 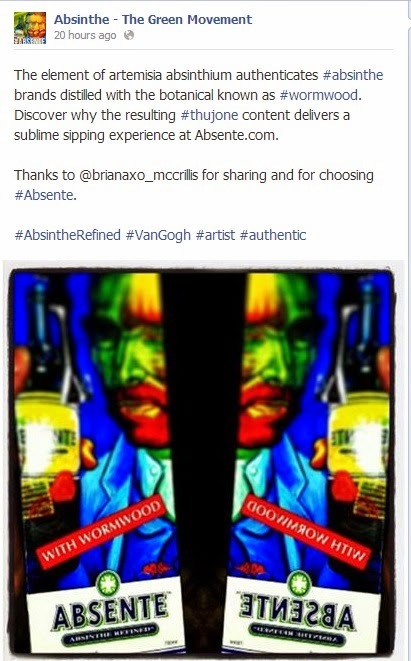 Some big names in the community dismiss absinthe as having any trippy effects. For me this is just not valid. I'm wondering why this is. If thujone can be active at very low doses. if another constituent of the distillate can be the cause, or if it's a synergism at play, which I think to be the case. As I have experimented with wormwood extract in it's own right. Not to give absent product any marketing because I am against their disinformative marketing, food coloring, and sugar. 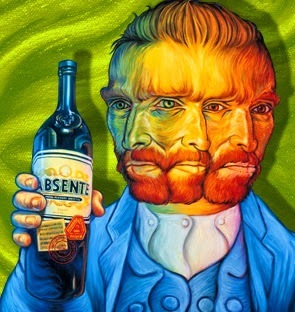 But, coincidence or not, I got the strongest absinthe effect I've experienced one night after drinking it. Do you think they could be adding thujone beyond the legal limits? I don't dismiss thujone completely in it's synergism in absinthe. Sometimes the spirit of something is able to come out in dosages that shouldn't be active. Homeopathy for example. Or maybe the spirit is absinthe itself born out of passion and creativity of the human spirit. Angelsetsfire, sorry for not replying sooner, but I literally JUST got this notification. Bottom line: thujone doesn't have psychoactive properties. Period. In high enough quantities, it can cause renal problems and seizures, but it has absolutely no recreational potential. Your statements about Absente help prove my point, since it has absolutely no thujone and you're getting the 'strongest effects' from it. Absente can't be 'adding more thujone', because their product gets tested by the TTB, just as all absinthes on the market in the US do. Never underestimate the powers of the placebo effect. After reading many different types of trip reports relating to wormwood and thujone and testing them and the like for absinthe, I don't believe that thujone is completely inactive, at all. Rather than give my arguments for it, I just stumbled on someone's posts that make a lot of good points. The second link being the more significant one. Check it out if you're interested. Hope you don't mind me posting links. Along with the reply below, I wanted to touch on the point that 'RawBeer' from the drugs forum made about vintage absinthe. He wondered about the stability of thujone in those bottles and whether the thujone had broken down or lessened while being in the bottle for all those decades. Well, he must not have read the study which came out in 2009, which dealt directly with that subject. Bottom line, thujone levels remained relatively constant when 'aged' via UV bombardment, which mimics the effect of long term aging. In high enough amounts, thujone does indeed create effects. But not good ones. Think renal failure and seizures. There is no recreational potential for thujone. Also, people can claim whatever they like about absinthe's effect on art and literature, but keep in mind that people from all socioeconomic circles drank it. If there were indeed added effects, you'd see a lot more evidence of it coming from places other than verse and art. Further, even using the example of approx 70ppm of thujone in an absinthe, that is still extremely low. There is more thujone in your Thanksgiving stuffing than that (sage has more thujone in it than wormwood). You don't hear of anyone tripping on stuffing. Last, going back to the mentions of effects in literature and art, there are just as many alliterations to similar effects caused by all types of alcohol, including wine, dating back to the ancient Greeks. It's what's known as poetic license.